A short word on resistors. There are two common kinds available. The brown (carbon film) and the blue (metal film) ones. They have a smaller tolerance (1%) compared to the carbon film resistors (5-6%). That means that the actual resistance is very close to what it says on the box. In contrast the carbon film resistors vary a lot more. 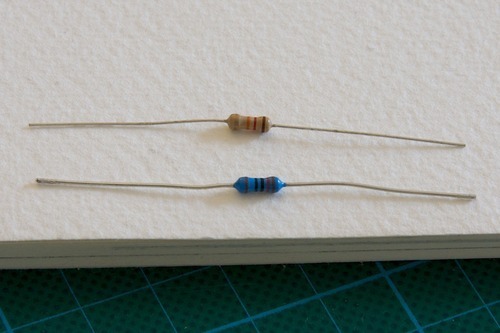 A 100 Ohm carbon film resistor can have an actual resistance of only 88 Ohm which is quite a difference. I mention this because initially I bought two boxes of the brown ones and I didn’t know about the difference. The advantages are not big enough to throw away all my carbon film resistors as they still work but I prefer metal film resistors from now on. This entry was posted in regular and tagged electronics, parts, resistors. Bookmark the permalink. ← But what parts are needed to get started?